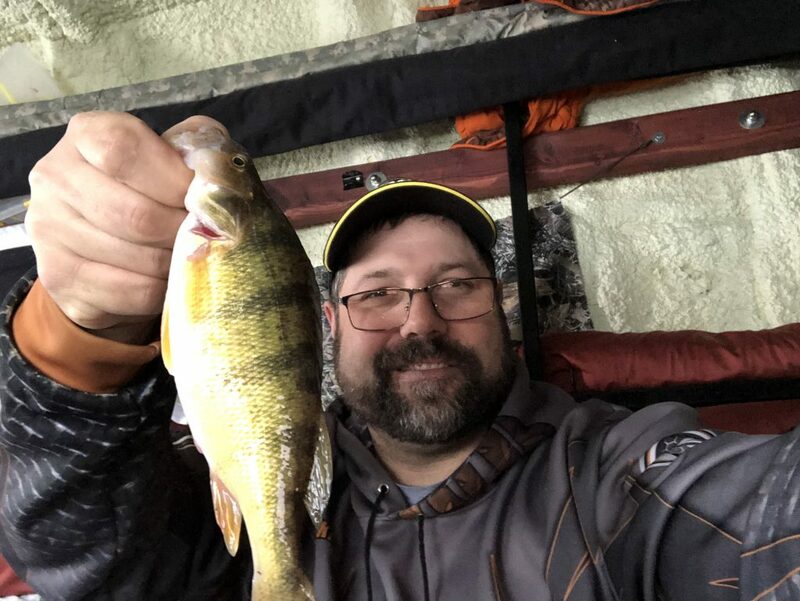 With the cold weather and also having hockey this weekend I was limited to only one day of getting out on the ice that I could fish. I also had my two little girls with me and they love to go, but I usually try to keep it close and make sure I have plenty of snacks and things for them to do. I must have done a pretty solid job of supplying snacks and entertainment because I actually had to tell them it was time to go home. Must be the guide in my blood. Anyway, with all the recent snow we have had I didn’t want to venture very far from home. We decided to go to a local bay near Bismarck off of the Missouri River. Recent years I have had pretty decent actually on some crappies, perch and an occasional bass. I’m not sure if the weather or the rising and falling water is keeping the bite a little quiet here locally. We did manage a couple crappie, one nice perch and a pike. I am seeing quite a few fish on the electronics, but honestly they are slowly appearing and slowly disappearing also so it tells me they kinda have those mid winter blues. Happens every winter, and all of the sudden the fish will snap out of it and all those marks you see, try and bite. The snow scene out on the lakes is pretty rough at the moment. I suggest traveling in groups and make sure you are prepared with shovels, straps, chains, sand to get yourself unstuck because it’s going to happen. Almost need some form of tracks if the weather continues. The bays in and around Bismarck can at times be fun to fish and are often overlooked. Plain hooks with minnows on bobbers seem to be a safe bet when fishing these marinas. Pretty much every species will hit it and you just never know what your going to catch, which adds excitement!